but then I remembered, it’s the little things. The little things in life mean the very most. 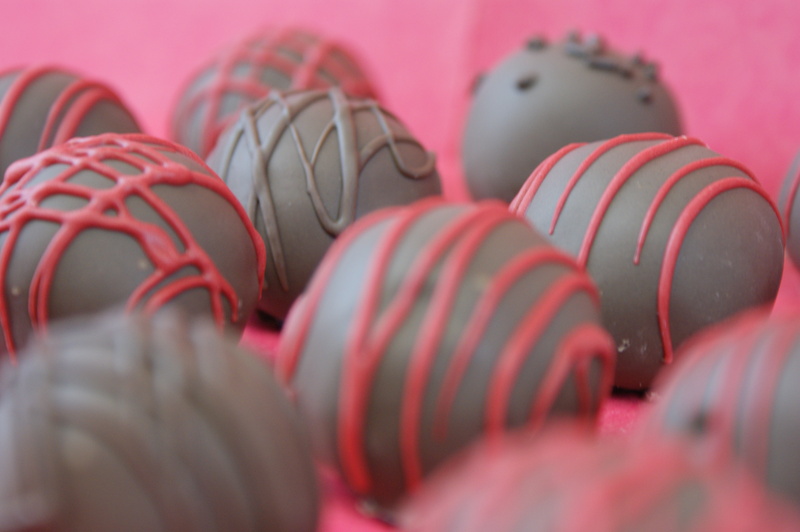 Like chocolate cake covered cherries. 2. Crumble cooled cake into a large bowl. 3. Mix thoroughly with frosting (it may be easier to use fingers to mix together). 4. 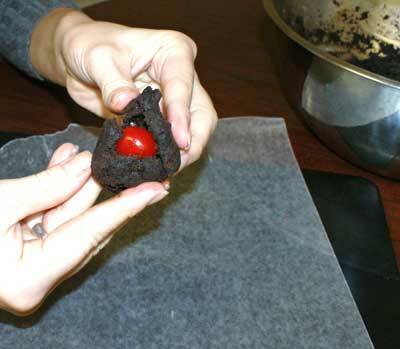 Make sure your cake ball mixture is very well mixed and mold a little “nest” out of the cake mixture, place the (dry) maraschino cherry in the center of the cake mixture, wrapping the cake around it and add a little extra cake mixture if needed to completely cover the cherry – then just roll, roll, roll on a wax lined baking sheet. 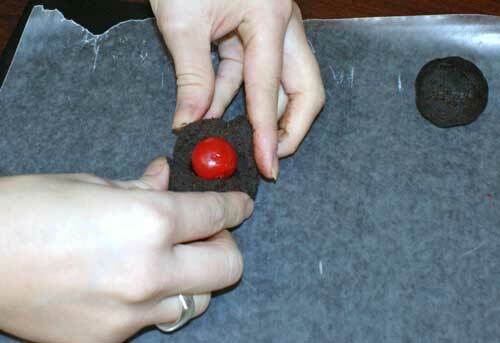 If it starts to fall off, firmly press the cake mixture together and re-form around the cherry. 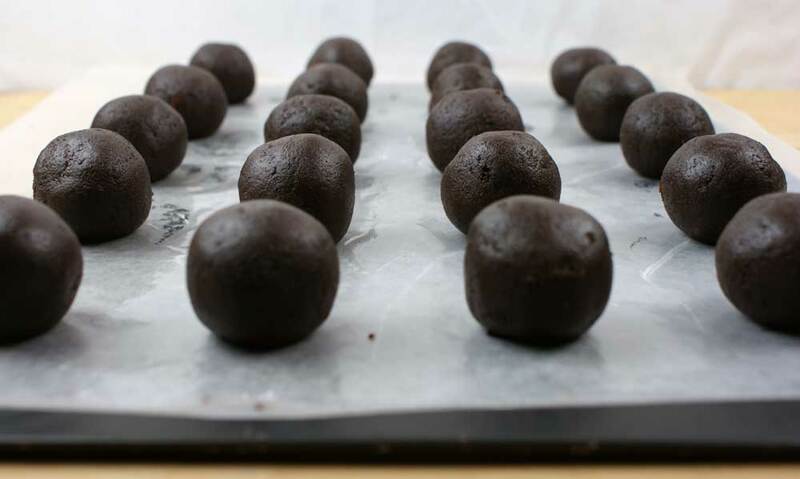 They should be about (1″) sized balls; place cake balls in refrigerator and chill for approximately 1-2 hours (to speed up cooling, stick in the freezer until firm). 5. Melt Chocolate CANDIQUIK Coating according to directions on package. 6. 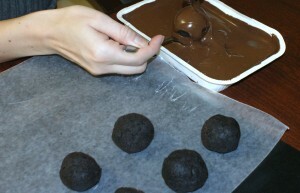 With a spoon, dip balls in melted Chocolate CANDIQUIK; place on wax paper until set. TIP: If cake balls start to stick or get gooey when dipping, place the remaining cake balls in the refrigerator or freezer until firm again. 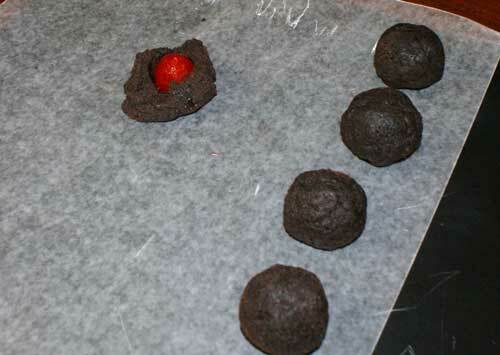 i like it Chocolate-Cherry Cake Bites! For an adult twist, try draining the cherries and then filling the jar with Southern Comfort. Put it in the freezer for about a day. Drain the cherries and proceed. 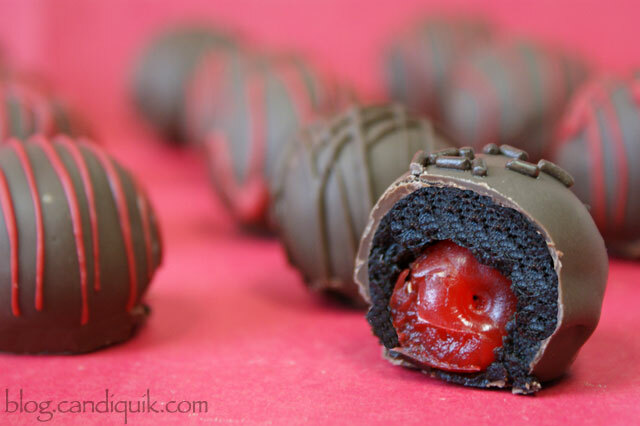 I just saw a recipe for chocolate covered cherries like that recently but I think it would work well for these cake bites. The chocolate-covered cherry recipe suggested serving the cherry-flavored Southern Comfort you have leftover on top of vanilla ice cream. I am ecstatic to tumble across your website !!!! My 13 yr old daughter and I love baking together. We made 400 cake pops with a friend overnight for a event once and that was a feat! Thank you for such an amazing website and such easy to follow instructions!! We tried the spoon and roll, toothpick but fell off and fork crumbled. That was after cooling for two hours. But we’ll keep trying ! When you coat yours what is your method for getting the coating over the entire ball?? We also learned that edible glitter stains the mouth!! So we nixed the blue which we planned to use, don’t think the bride would appreciate her guests having blue teeth in the pictures! !